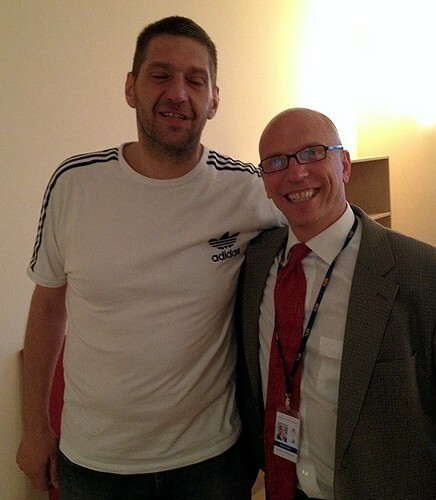 A couple of days ago I met Igor Milanović, who many experts consider the greatest water polo player ever. We were looking for a new apartment and our real estate agent showed us an apartment for rent owned by Igor. Water polo is huge in Serbia a and the region, and Serbia is usually one of the best teams in the world. They won bronze at London 2012. The two greatest water polo nations are Serbia and neighbor Hungary. Milanović’s career achievements are amazing! He won 2 Olympic Gold Medals (LA 1984 and Seoul 1988) and 2 World Championships (1986, 1991). He would have probably won more, but Yugoslavia was banned from international competition during the war. Igor played 340 games for Yugoslavia, scoring over 500 goals. The 6 foot 4, 240 pounder, was a powerful player whose coach said could play any position. He was relentless in the pool and inducted into the International Swimming Hall of Fame in 1996. He was a really nice guy. He coached Partizan last year and they won the European Club Championship. I asked him how water polo players compare physically to the swimmers, and he said they are two totally different sports. I thought perhaps water polo players would make great swimmers as well. When I mentioned to my friends that I met him, everyone knew who he was. The Belgrade native is very famous in Serbia. It was an honor to get to speak with him. I’ve only been to one water polo match in my life and that was for the 2000 Sydney Olympics. I’ll try to take the family to see a match this spring.